Dear God I love pony hugs!!! 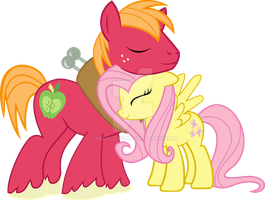 Fluttershy and Big Macintosh hugging hugging hugging. The hardest part of this was the arms. Ponies weren't built to hug so I scoured the episodes for hours looking for just the right arm positions. It was fun! Please be kind in the comments. I really don't care if you don't like this ship. EDIT: 500 favorites???!!! Holy carp you guys. Thanks. May I please use this in a motivational poster I want to post on Derpibooru, and maybe here on DA as well? Am I seriously still the only one that ships this? I mean, come on! Everyone ships Marble Pie and Big Mac now! Yes,Marble Pie is very similar to Fluttershy. Could I trace the outlines of the bodies to make a picture of two of my OC's hugging? I would of course credit you, but its fine if you say no. do you seriously need criticism? this looks awesome! Well there's always room for improvement and I have improved since making this. Thanks. BEST VECTOR OF ALL TIME IT'S SO CUTE!!!!!!!!!!!!!!!!!!!!! For hugging his best friend? How petty. can I use this as a base? are we allowed to make a base off of this? You would be but I think there's already been a base made for this. Oh nvm, the guy I was thinking of just recolored it. You can make a base. Water under the bridge. As long as you like it. Oh I definitely do like this rest assured. can you do rarity and applejack next??? Hugz and cuddlez are awesome!